What a beautiful country with an abundance of hard fighting fish. I had the opportunity to go Fishing In New Zealand and it was amazing, something I would recommend to anyone given the opportunity. During April and May of 2017 I travelled to New Zealand for 5 weeks with my wife and 6-month-old to spend time with our family. Obviously, I could not go without investigating what fishing opportunities would be available. I talked about this in an earlier blog post. 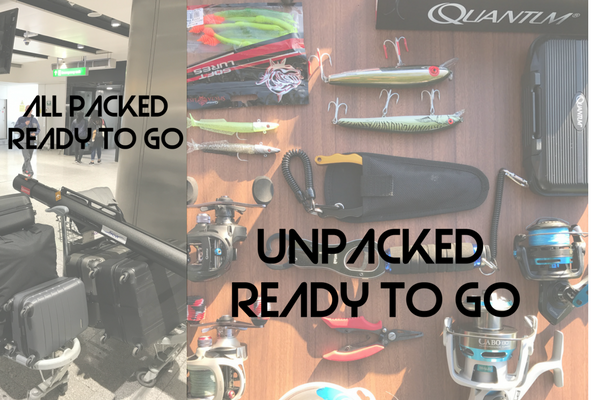 When travelling I always try to take some fishing tackle with me because it’s not always easy to buy tackle when you arrive at your destination. I have learnt this the hard way so I was sure to take a few rods and lures with me. 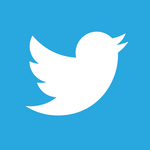 Is recognized to be some of the best in the world with a wide variety of salt and some fresh water species to target. 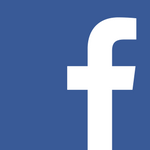 The most popular species being Kingfish and Snapper from the sea and trout the main target from any fresh water. I decided that my fishing goals for New Zealand would be to catch a Kingfish, snapper and trout on lures I packed accordingly. With preparations done goals set all that was need was to make the 28hr three flight trip to Auckland. One of the first things I did when we had arrived and recovered from the jet lag was to visit one of the many fishing tackle stores to get for some tips and advice. 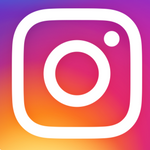 The guys at the Hunting and Fishing New Zealand store in Thames were brilliant they advised me on the best places to try when fishing from shore, what charters to consider and where to try my luck for trout as well as advice on the best tackle. 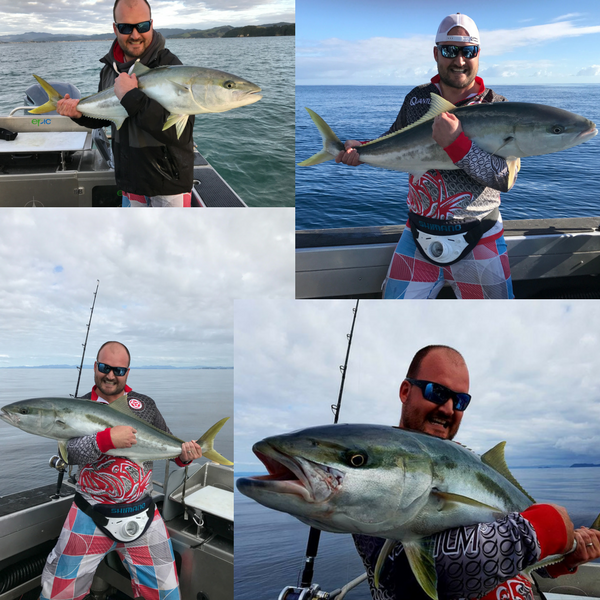 When it comes to licensing and regulation It is simple, in New Zealand for recreation anglers anything salt nothing required, anything freshwater requires permits/licensing and these vary depending on your location. Most of the tackle stores can sell this to you as a tourist and for more info click here. Armed with the knowledge my fishing rods and a cup of coffee I made my first trip early one morning to fish the shores of the Firth of Thames. Located on the North Island where I wanted to target Snapper and Kingfish with lures. As with doing anything new it did take countless casts, lure changes and a tide change to find the winning formula to get my first fish. What a proud start it was a hard fighting Snapper on a soft shad lure which I measured and released. 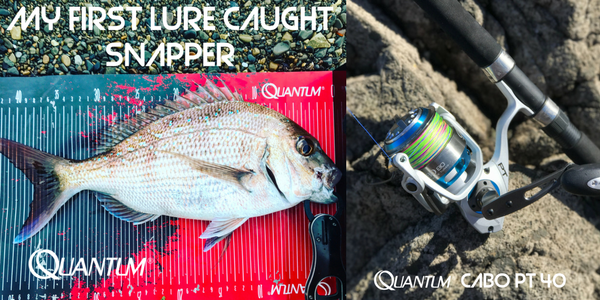 That first day I caught a few snapper and a couple of Khawai on small 4 inch shads fished around rocky terrain as it was nearing high tide. Driving home that afternoon I was made up, my first mission and a goal accomplished on my first outing things could not have gone any better. The next couple of trips would see me trying my best to catch one of the famous Kingfish from shore. I tried everything from casting lures too cutting large pieces of bait and sitting behind a rod for hours waiting and praying for a take. Let me tell you there is nothing more frustrating than arriving at a spot setting up your rods and watching the target fish swim straight past your offerings without even giving it a second look. This for me was the final straw if the Kingfish were not going to come to me on the shore I was going to go to them in the deep blue. Enter EPIC Adventures. 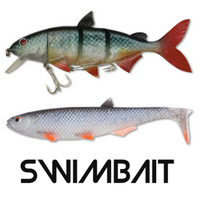 No company name could ever be more fitting, these guys really do provide anglers with epic fishing adventures. 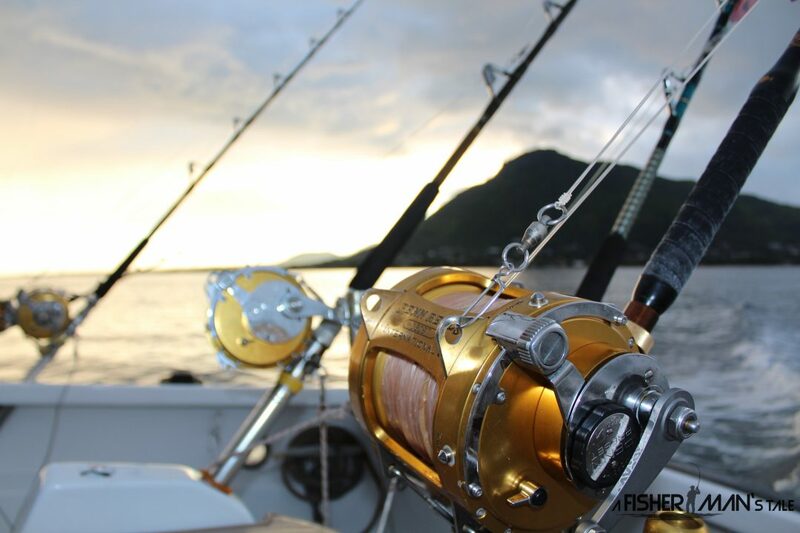 I highly recommend this set up if you are looking for a charter on the north Island of New Zealand. The booking was made for a Monday when the weather forecast was the best and calm seas were predicted. I have been out on rough seas in the past and it’s no fun if you are not used to it. 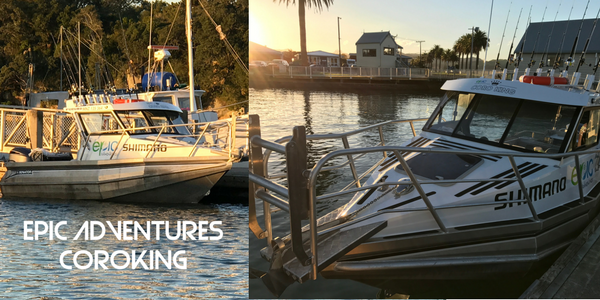 Arriving at Whitianga Harbour to board the CoroKing captained by Owen Williams and joined by two other anglers one from New Zealand and the other from Australia. You could not have planned the day better. We were all mad keen anglers from the southern hemisphere with competitive spirits so a little friendly competition was agreed with the winner taking the tri-nations bragging cup. 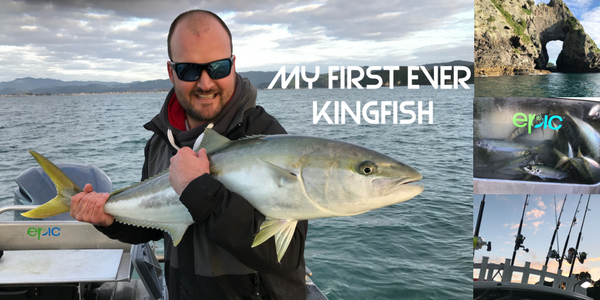 Even though I really wanted to be able to target the kingfish with lures Capt Owen explained to me that the time of year and conditions were not ideal for lures or vertical jigging methods although I was welcome to give it a crack. I decided to take the advice of the captain and stick with catching king mackerel as live bait for the days fishing. Whilst we were filling out the live wells with the bait fish Capt Owen threw out a free line bait. Within a few minutes line was being stripped off the reel and the rod was handed to me. BOOM my first ever kingfish landed within 20minutes of boarding the boat. My day was made as far as I was concerned. It was not the biggest maybe 12-17lb if that but man did it fight like stink. Regularly striping line of the reel. High fives all round and lots of whopping and hollering from me in celebration. Capt Owen fired up the engines and started our 30minutes journey to our first spot. On the way we stopped by some really impressive looking rock formations in the middle of no where. On arrival at the first spot we tried trolling in shallow water with no luck. Firing up the big engines again we moved to a deep reef to spend most of the day. The method we used during the day was to drop down our live bait between 70-80meters on this reef. This is something that really demonstrated the skill of our captain. On the first drop at almost the exact depth that Capt Owen said I would get bites, I did. The rod wrapped round and I doubled over as this fish did its best to pull me overboard. I finally landed the Kingfish, after a 10 minute battle. The trip really did make my whole Fishing in New Zealand that extra special. We landed fish regularly though out the day. Including 12 Kingfish between the three anglers. A mako shark for me taking 25 minutes to bring to the surface. A whopping 400lb Bronze whaler shark for the Aussie. The shark took nearly an hour to land the biggest Capt Owen had ever seen. The Aussie did also catch a Hapuka, Which eventually sealed the tri-nations bragging rights for him. I came in second place. The final part to my tales of Fishing in New Zealand was to land a trout hopefully on lures. Returning to the fishing shop I originally visited to pick up a 24hr fishing permit. I headed to a stretch of the Ohinemuri river that runs through the Karngahaki Gorge. Probably in the top 5 of the most visually stunning places I have been fishing. Armed with my light rod a hand full of small lures and a suitable spot to have a few casts. The river was crystal clear with a slight mist rising which had a chill about it. Not bothering about the chill I was not long into my first rainbow trout. Weighting only about a pound it was fun to catch, that day I only managed to land 2 fish but lost loads in the fight. Having landed all the target fish I was after, catching countless Snapper beautiful rainbow trout and hard fighting Kingfish. This trip will go down as one of the most memorable for me. The beauty of the country and the time spent fishing. Walking down the rivers, rock hopping the coast line and speeding across the big blue. Fishing in New Zealand must be some of the best in the world. 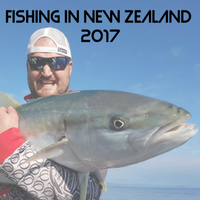 If you would like more information on fishing in New Zealand I have included some useful links below.